Le Chatelier's principle, announced in 1888 by the French chemist Henry Louis Le Chatelier (1850–1936), states that if a system in a state of chemical equilibrium is disturbed, the system tends to neutralize the disturbance and restore the equilibrium. It is especially applicable to reversible processes in chemistry. However, there is always a two-way reaction taking place. While molecules of hydrogen and iodine are joining up to create molecules of hydrogen iodide, molecules of hydrogen iodide are dissociating to form hydrogen and iodine. The proportions of hydrogen, iodine, and hydrogen iodide finally reached in the reaction (i.e., at equilibrium) can be changed by altering the temperature or gas pressure, or the concentration of any of the three reagents. It is possible to predict the way these factors alter the final proportions reached – which is of great use in an industrial chemical reaction – using Le Chatelier's principle. What is the effect on this reaction of changing the pressure? When ammonia is formed, there is a reduction in the number of gas molecules, and the gas pressure is reduced. So, according to Le Chatelier's principle, an increase in external gas pressure will be counteracted by an increase in the number of ammonia molecules formed because this will counteract the effect of the increasing gas pressure. Increase in gas pressure therefore increases ammonia yield. The yield is affected by a change in temperature, too. 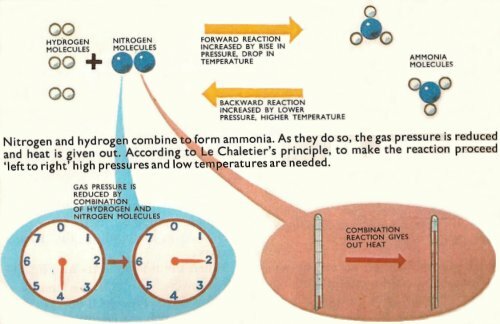 According to Le Chatelier, a reduced temperature should increase ammonia yield because the reaction will proceed in such a way as to give off more heat, to counteract the drop in temperature. This is accompanied by an increase in ammonia formation. But there is a complication here, because although the final proportion of ammonia present is increased the drop in temperature reduces the rate of the reaction, so the result takes longer to be achieved. For this reason, the temperature in the industrial production of ammonia is not kept much below 500°C. Lastly, the change in concentration of the reagent has an effect on the final equilibrium yield. If, for example, nitrogen is added, Le Chatelier's principle tells us that the reaction proceeds "left to right" to counteract this, so more ammonia is formed. The same thing applies if more nitrogen is added, or ammonia removed.